A simple herbal brew consisting of Dragon Well Green tea and Chrysanthemun flowers that will help to balance the excessive Yang in your body. My night-time ‘cluster’ headaches seem to have subsided in the past few days. In Chinese Traditional Medicine, occurrence of headaches is thought to be caused by the body becoming overly yang (hot). To redress the imbalance, we required yin (cool) food or drink. 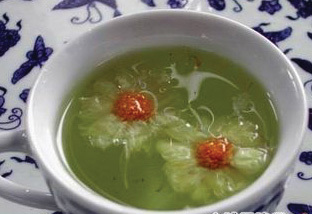 Hence, I have been drinking Chrysanthemum Dragon Well green tea. Both chrysanthemum and Dragon Well green tea are not only cooling but can lower the blood pressure. Chrysanthemum also has the attribute of detoxifying the liver and brightening the eyes, as every Chinese mother knows. I have been eating simply, inspired by Temple Cuisine expert Mari Fujii’s workshops and books, for example making simple dishes like edamame soup and mild ginger rice. Rehydration is very important so I have been drinking lots of diluted Sencha. I then collect the used tea leaves, dry them in a low oven and wrap them in a muslin cloth to put over the radiator so that my room is fragranced with a gentle sweet Sencha smell, which helps me enjoy a calm and restful night. Simply brew with near boiling water for about 15 minutes strain and consume once a day. – Boil the edamame in their pods in salted water. Shell when cooked. – Blend the edamame and used kombu in the food processor until smooth. – Add shoyu, salt and tofu and simmer for 3-4 minutes. I am about to fly to China, following my Malaysian tea master Hooi to the famous Tianfu Tea Institute in Fujian for a week’s tea course the climax of which will be a tea ritual which I will design and perform. Rather than doing a purely traditional ritual, I have decided to fuse elements of English afternoon tea, Chinese gongfu cha and the Japanese tea ceremony. I’m hoping I can get a video recording of it to post in a future blog. I know what you mean about the Yin/Yang values in the diet. I recently had to stop drinking a lot of puerh because it was overheating me and I had headache situations from that myself. I’m pretty balanced with my diet otherwise, in the eyes of the Chinese.